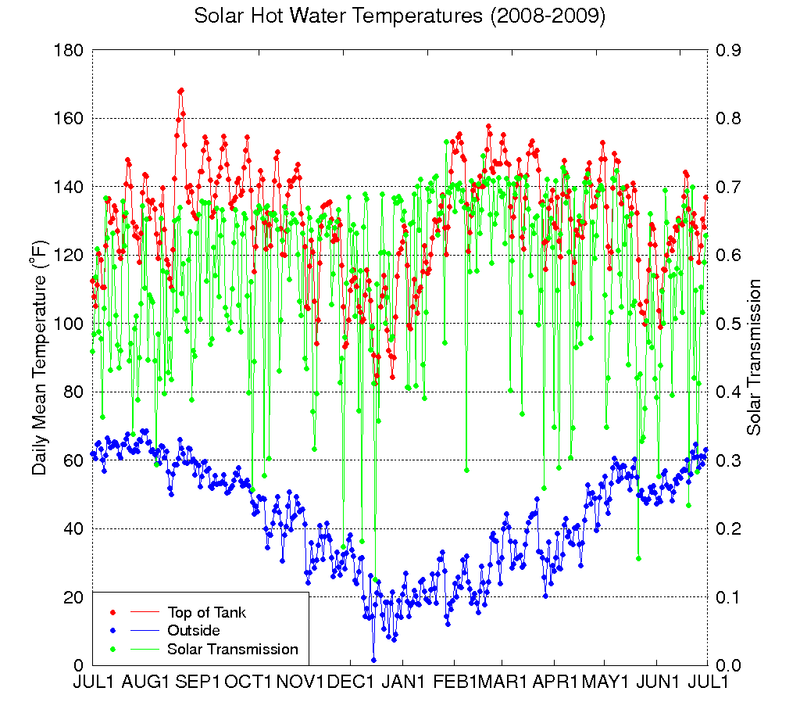 At the end of June 2007 we installed a solar hot water system from Butler Sun Solutions . 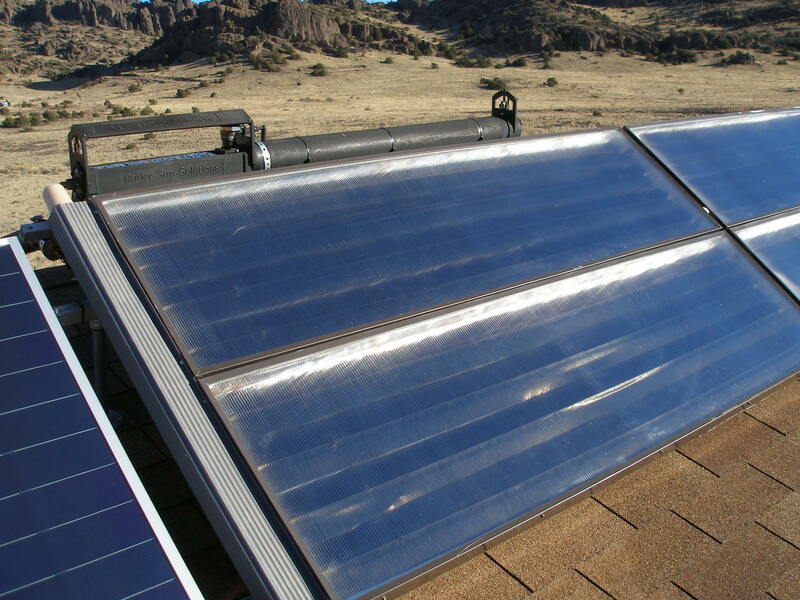 It is a closed loop antifreeze system that heats water in our existing propane hot water heater using a Solar Wand heat exchanger. 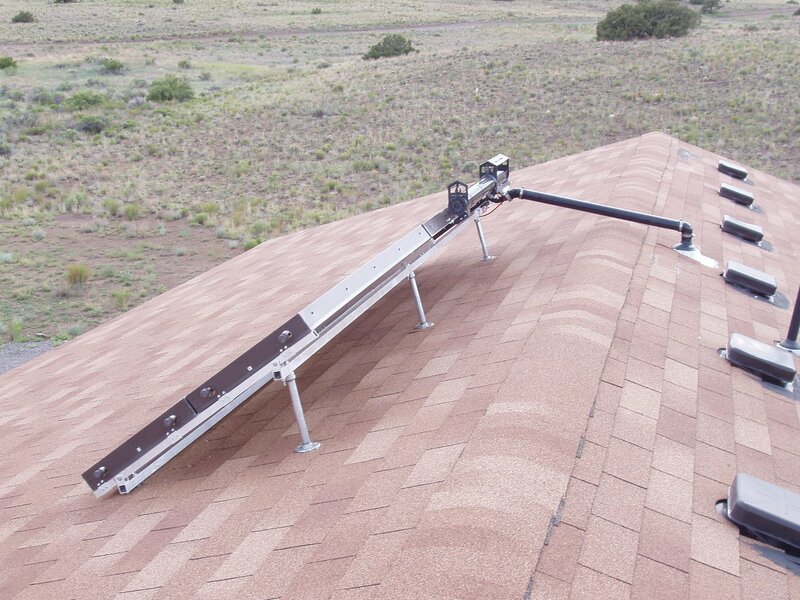 We have four Fireball 1001 collectors from ACR Solar International for a total of about 40 square feet of collector area. 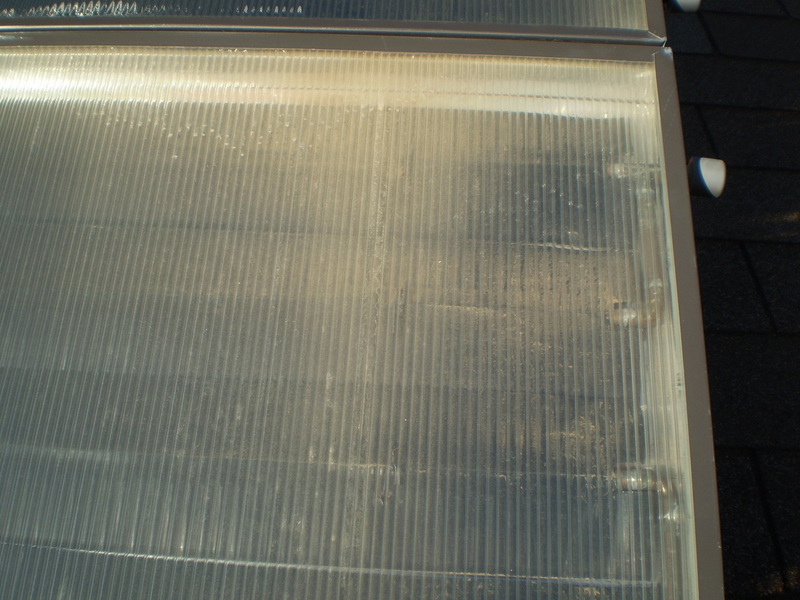 On the left side of the collectors is a small 21 W Uni-Solar photovoltaic module that powers the Ivan Labs EL-SID pump, which moves the antifreeze fluid through the collector loop. 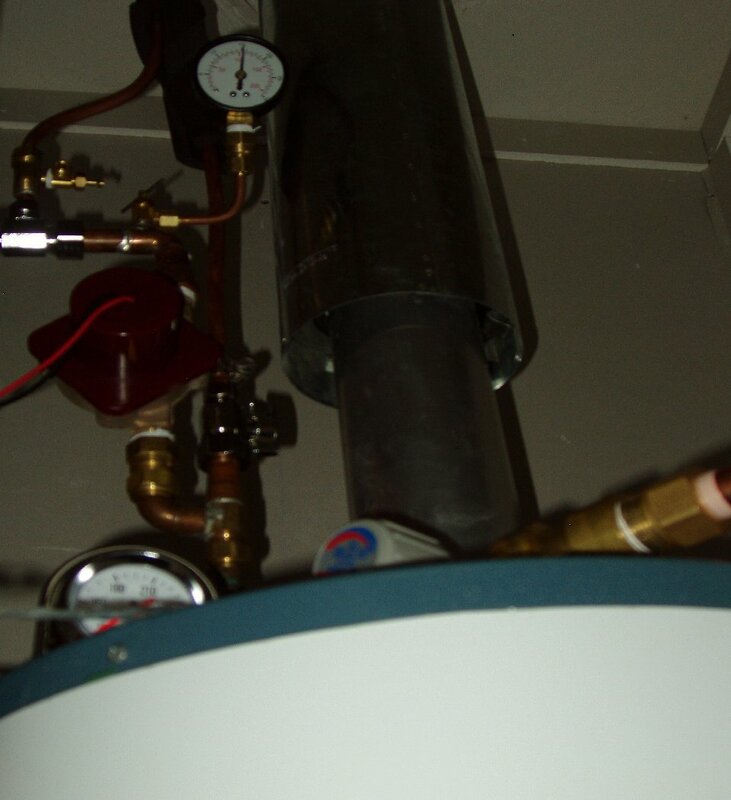 The hot water tank has since been insulated with an R11 fiberglass blanket and some Thermax rigid insulation. 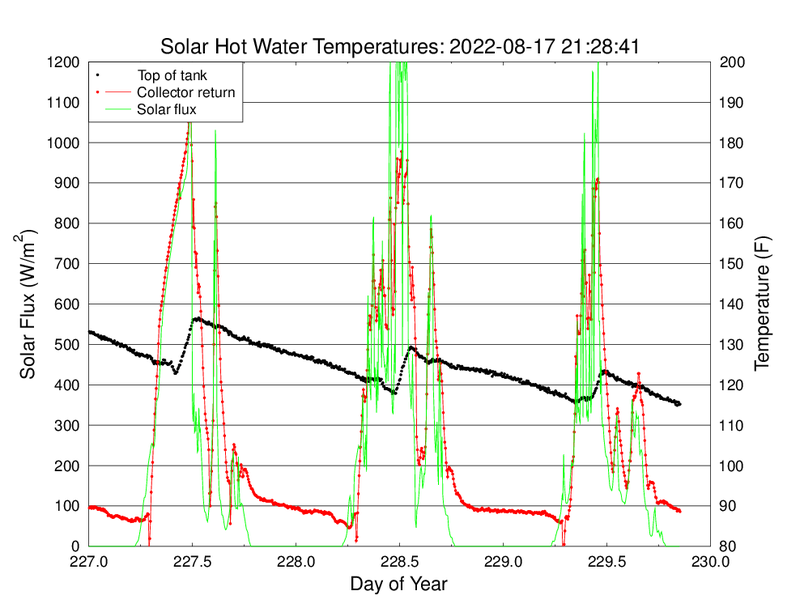 We are monitoring the performance of our Butler solar hot water system by measuring temperatures of the top of the hot water tank and of the collector return loop (before it enters the Solar Wand). The temperature probe on the top of the tank is on the outside of the inner tank under some insulation, but it presumably is still cooler than the actual water temperature. 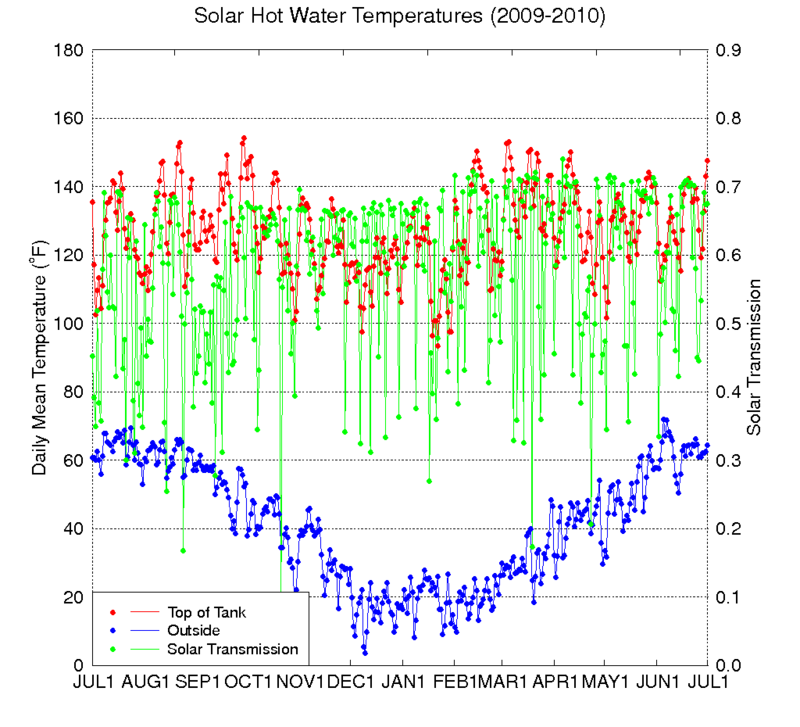 The temperatures are measured every five minutes (along with the solar basement temperatures). 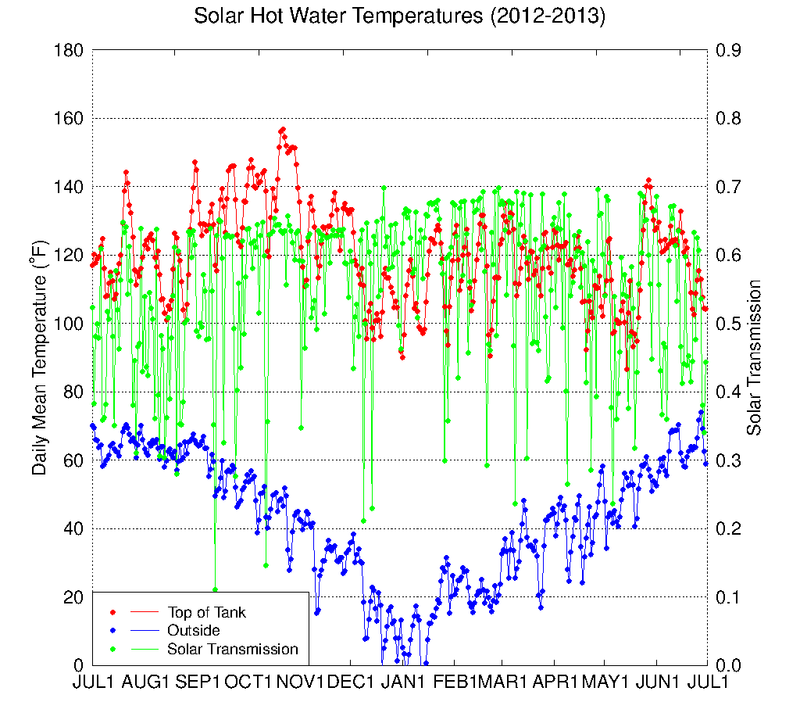 The solar hot water temperatures for the past three days may be viewed on this graph . 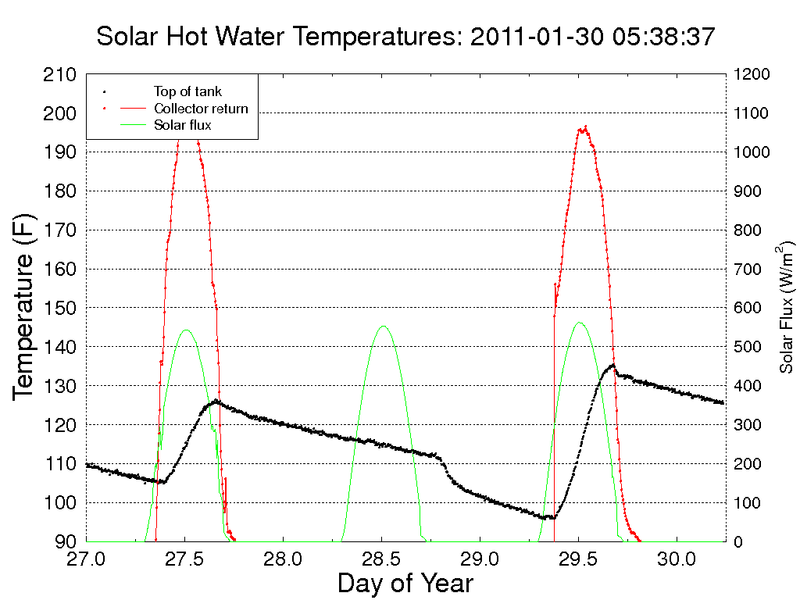 From the nightly tank cooling rates we determined that the Newton's Law of Cooling time constant is more than four days. The additional tank insulation is important for keeping the water hot through cloudy days. 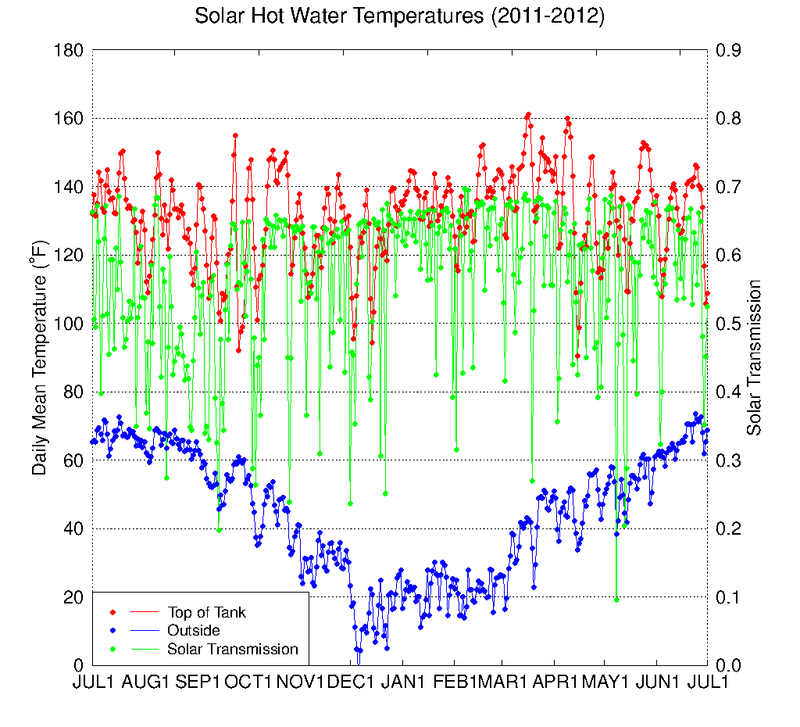 The graph also shows the daily mean outside temperature and solar transmission as measured by our weather station. 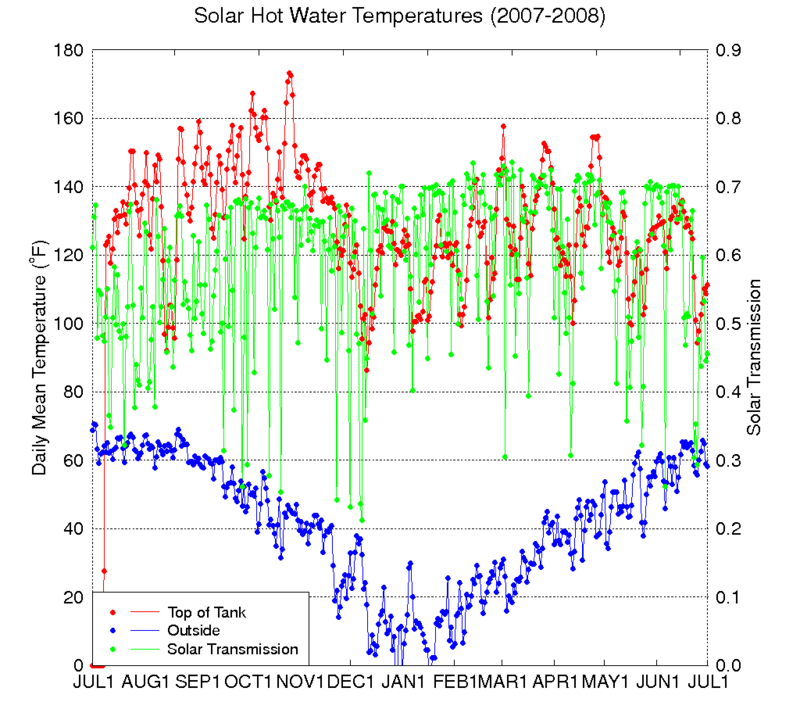 The top of tank temperatures are consistently well above the 100oF needed for adequately hot water. 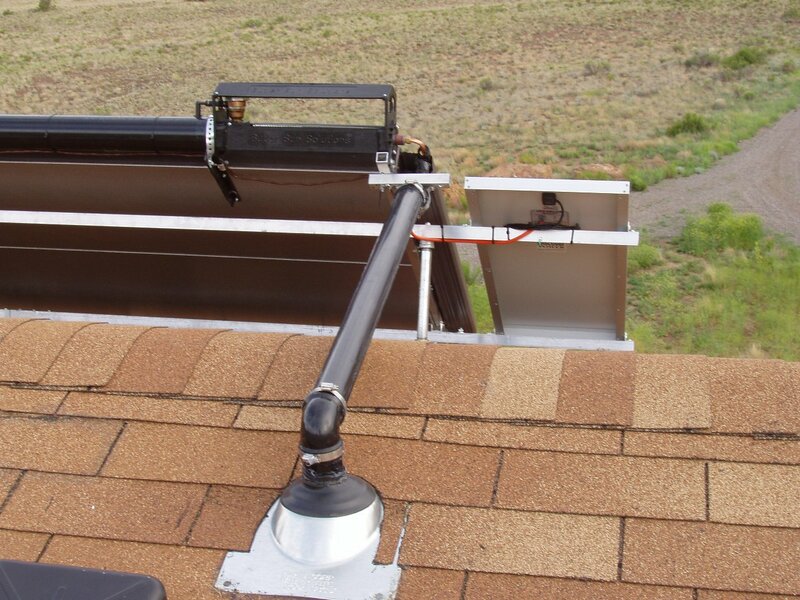 An "anti-scald valve" mixes the hot tank water with cold water to limit the hot water to the house to below 120oF. 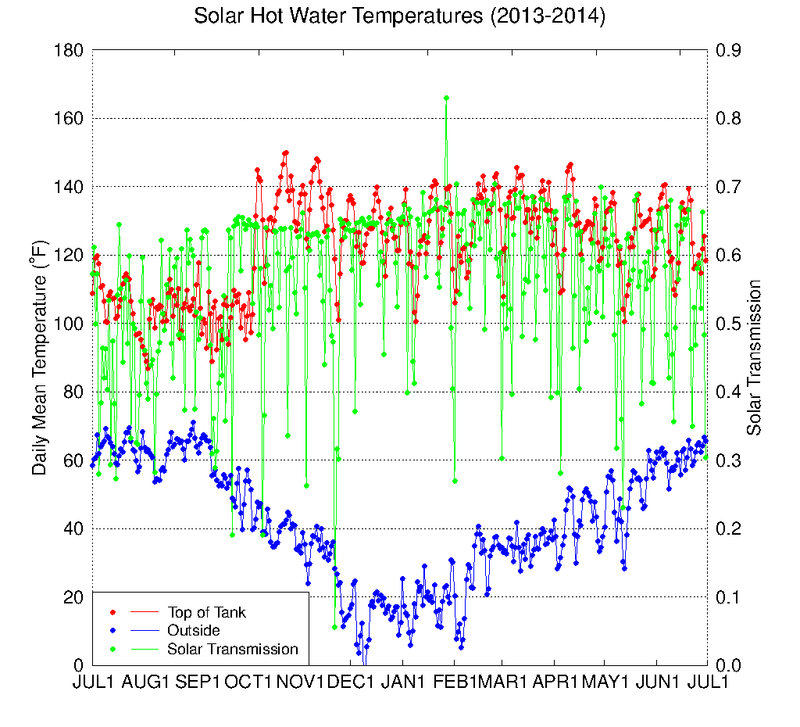 Our hot water has been nearly 100% heated by the Sun because we turned off the hot water heater pilot light. 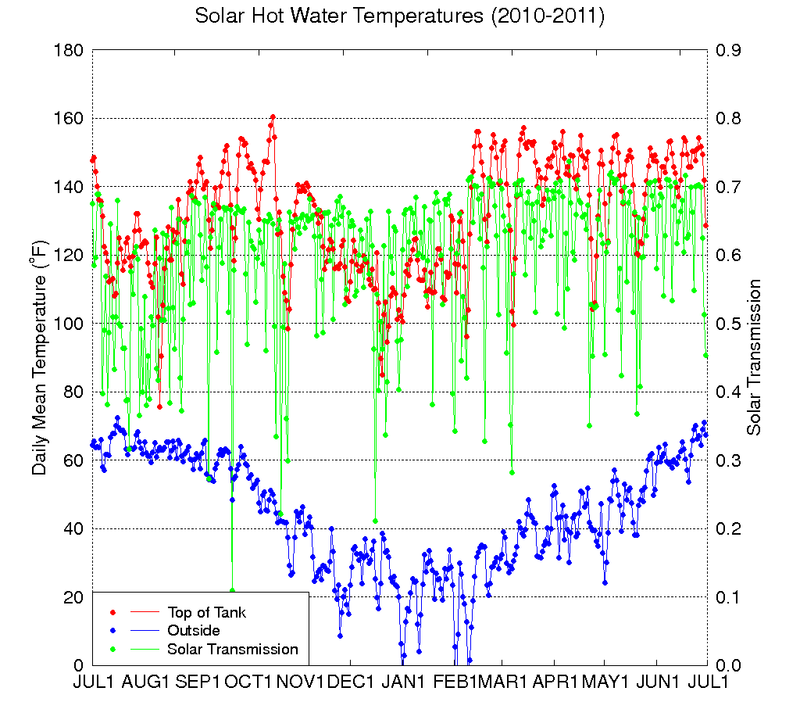 In the 2011-2012 season we only fired the propane hot water heater for 1.25 hours. 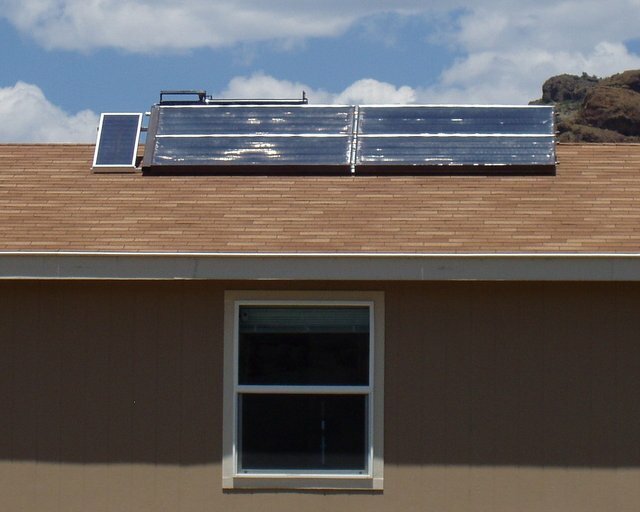 With only about 1.5 full time occupants using low flow showerheads, the system was deliberately "oversized" so that nearly all of our hot water would be heated by the Sun. 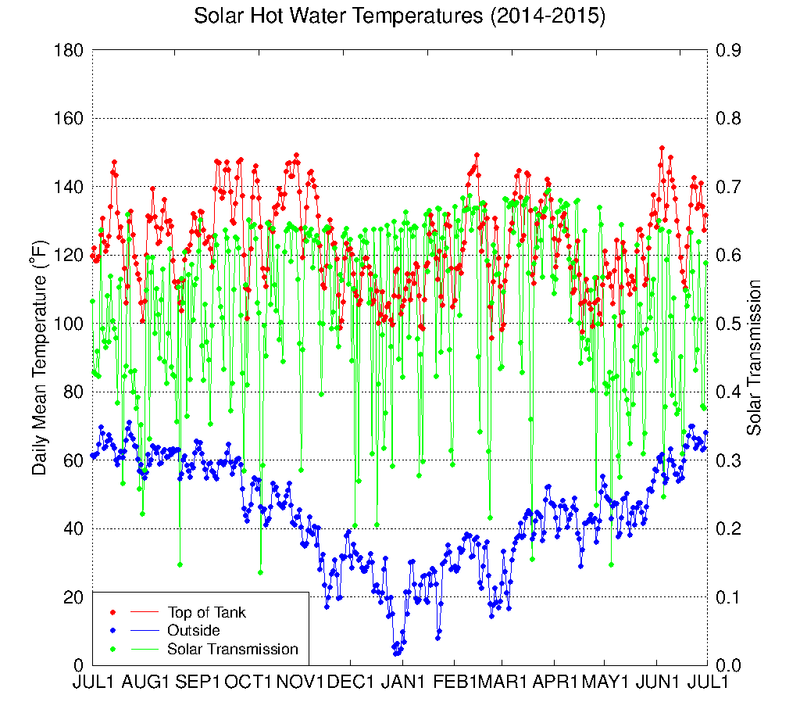 We had periods of a substantial drop in solar hot water performance, characterized by higher collector return temperatures and lower hot water temperature gain (even on sunny days). The good performance has been restored by flushing the collector loop with water and adding new antifreeze solution. We think the cause of problem was the heavy mineralization of our well water, because the problem has been mitigated by using distilled water. We had a slow decline in performance due to dust in the collectors. 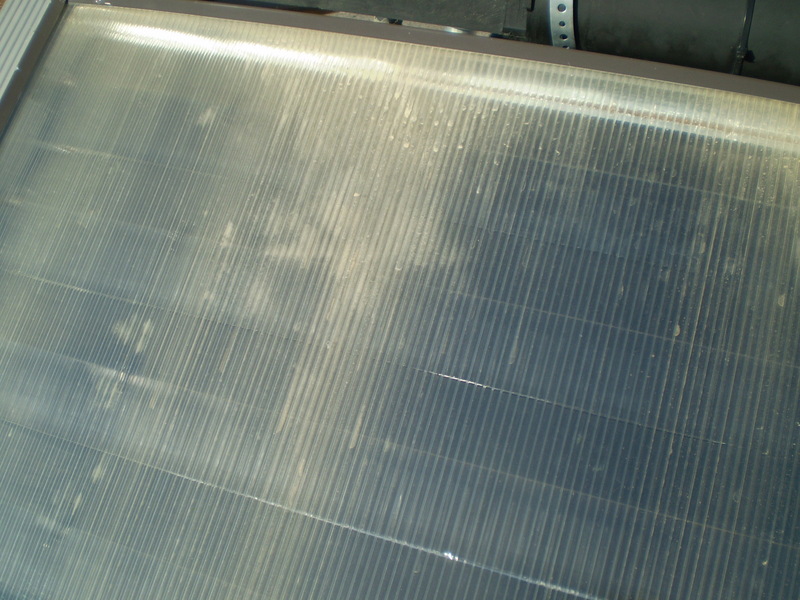 During windstorms dust had blown in the collector openings around the pipes and had even gotten into the air spaces in the polycarbonate glazing . 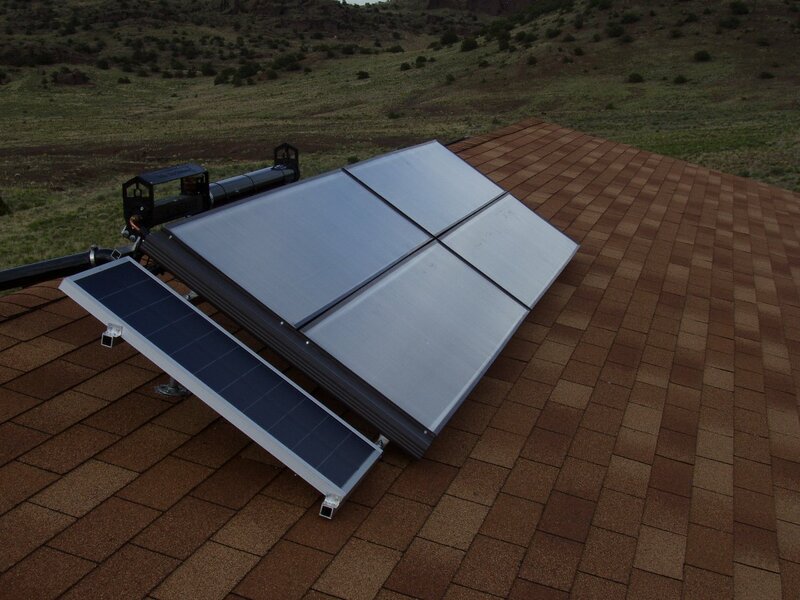 ACR Solar International has since changed their manufacturing process to prevent dust or moisture buildup in the glazing, and they very generously offered us new polycarbonate glazing for just the shipping cost. On 2011-01-28 we took the collectors off the roof, removed the old glazing, cleaned the dust off the black collector surfaces, sealed the new glazing in the collectors, and reinstalled the collectors on the roof with pipe insulation in the openings to prevent more dust buildup. 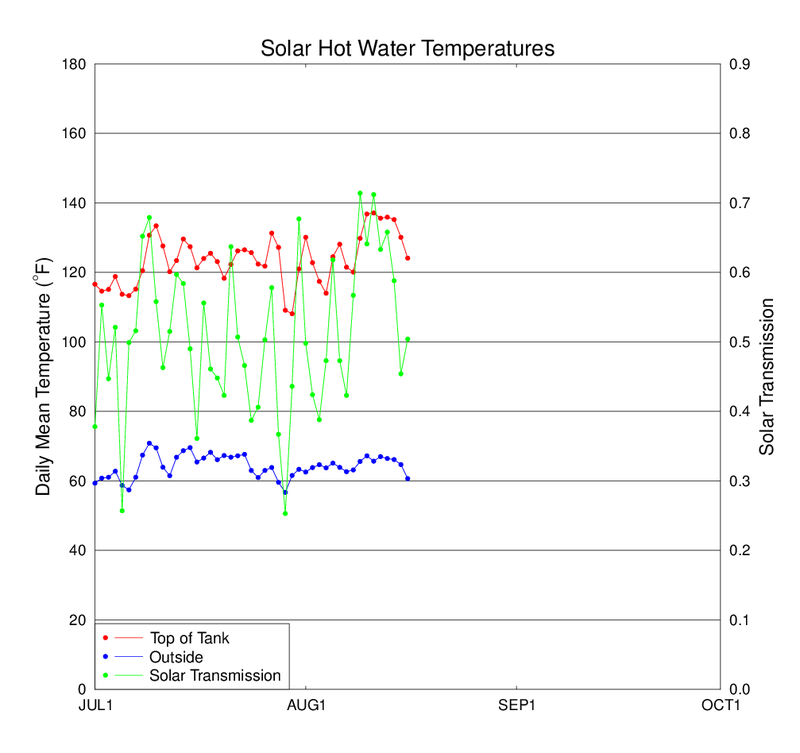 A graph of the solar hot water temperatures over the three sunny days around the collector cleaning illustrates the dramatic improvement in performance.